Love Groundhog Day. LOVE it. Favorite scene is the suicide scenes. Haha! I wouldn’t have thought that would be your favorite part. But even that montage is brilliant of course. I know, it is weird, isn’t it? But the whole thing really showcases the genius that is Bill Murray–it’s desperate, so very sad, angry, and hysterically funny in those intense moments where you can both feel for him deeply and laugh hysterically. I don’t know of many other actors who could do that and still retain the character’s basic dignity and sense of fun. I’m *A* god. I’m not *THE* God. I don’t think. LOVE the movie! One of my first internet passwords was something from the movie in fact. Great post. Now I have to watch the movie this weekend…Chris has never seen it! That must be fixed! Oh my gosh, I hope you remedied that ASAP!! GROUND HOG DAY WAS THE BEST MOVIE EVER AND BILL MURRAY FIT THE BILL PERFECTLY. 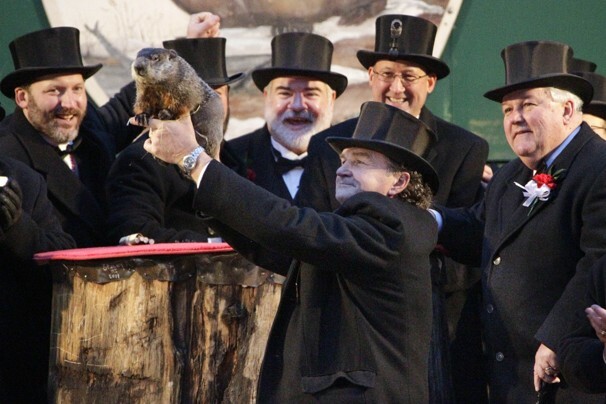 DO YOU EVER WAKE UP AND FEEL YOU ARE HAVING YOUR VERY OWN “GROUND HOG DAY”? I’ve been to Woodstock on Groundhog Day. It’s pretty great. I know! It was a fantastic trip, huh?